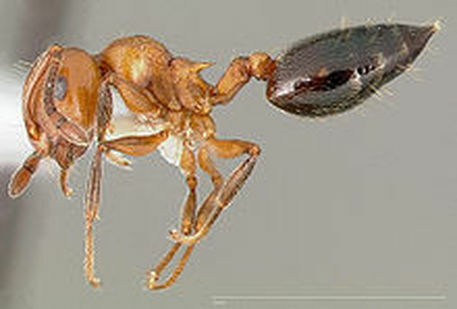 This is an Acrobatic Ant. Acrobatic Ants lift their abdomens up over their head and that's why they are called "Acrobatic Ants." This behavior is especially common when you disturb the ants nest. They will also give off a funny smell as a defense. Like many types of ants you can look for nest signs such as dead ants, insulation that is disturbed or heavy ant traffic. These tiny ants are also a little more noticeable than other ants because they wave their "tails" in the air as a warning. If you have old termite damage these ants may fill in the space and make it their new home. What do Acrobatic Ants eat? Acrobatic Ants eat both sugary foods (so you will see them in the kitchen often) and meat in the form of other insects or leftovers (so they may nest near trash or compost bins). Aphids also provide food for them as a defense system. How do Acrobatic Ants get into my home? Most likely, Acrobatic Ants will walk right through your front or back door, or more specifically, under. They can get through tiny cracks. Other common places would be through plumbing, pipe holes or ventilation holes under the house. If you have any tree branches touching your house they may use that as a bridge. All ants are amazing climbers and they can easily climb up the side of your house and make your attic their new home. How do I get rid of Acrobatic Ants? Getting rid of Acrobatic Ants, or any ants for that matter, starts with a pest inspection. We need to find the source of the problem, correct the main issue, but also find out how to prevent Acrobatic Ants from coming back. Give us a call or shoot us an email and we will be happy to help you with your Acrobatic Ants Control Problem! To learn more about Allegheny Mound Ant click here!